Salvador Dali famously said that statement, so I will give him credit. Because it’s the perfect sentiment for this slice of our documented life. 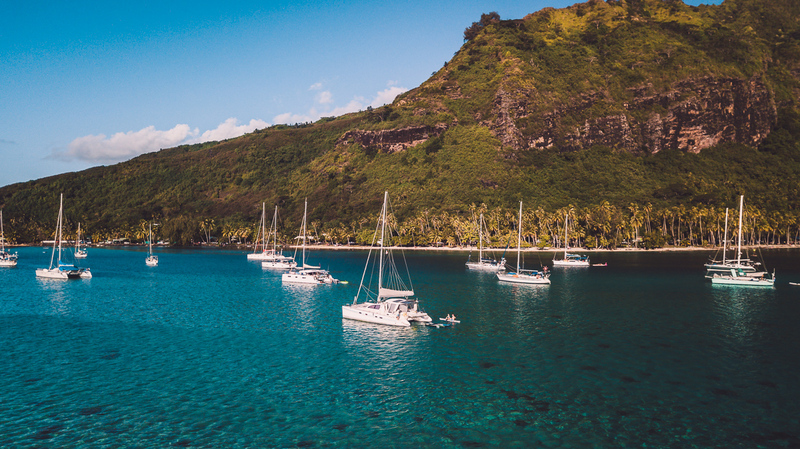 Moorea and all of French Polynesia is visual dream. The landscapes are physical representations of the scenes you read about in books and then wonder if they really exist. It took us six hundred and eighty-two solitary hours of sailing across the Pacific Ocean to get here. But those hours are slowly fading into the background, floating in a sea of other fond memories. We’re reaping the rewards of a sailors life and feeling pleased as punch about it. The typical #BoatLife problems like worn bottom paint and a fridge on life support, feel less important than the adventures surrounding us. Plus, the wind has returned and another anchorage is calling our name. So slap on some sunscreen and lets go sailing! WHAT’S WITH THE RED ROPE? Wondering what we’re doing with the extra red line attached to the genoa? Well, that is our version of a Barber Hauler. It helps get the sail out a little further and hold better shape when sailing deep downwind. If all of that makes no sense to you, try googling Barber Hauler. WHAT HAPPENED TO THE FRIDGE? Another glimpse of paradise – thank you guys. By the way, we noticed you have pretty well scrubbed all of your antifouling off the hulls. Before you put more on, have you checked out Coppercoat? We and many other cruisers use it, and save a heap of expense and hassle in doing so. One application is good for 10-15 years or more (you will probably have moved onto another boat by then :). You will still have to scrub from time to time (probably no where near as often though), but it is two-pack epoxy, so is as hard as your gelcoat. Just a thought. In the meantime, we look forward to the next episode. What are info are you logging in the iPad and what app is it? They keep an electronic ships’ log and I believe the software is ActiveCaptain. It interfaces with their Garmin instruments to log course, speed, etc. I noticed the dates on your interactive map of French Polynesia were dated July 2018. Where are you now? Watching you and Jason is like having that first cup of coffee in the morning….extremely satisfying! Safe sails and thank you for all of your videos. God Bless. PS: I too hope you get your fridge fixed soon. And when is Nicky going to put out a cookbook?? My Plate Has Been Overflowing With Such That I Hadn’t Been Able To Follow Y’all Lately. Last I Touched Base, You Were Approaching The Canal. Much Appreaciado & You Reaffirm My Faith In Humanity. I feel better just knowing these Upbeat, happy, healthy nomads are out There. One of the best videos yet scenery wise and incredulous water. The water looks rich with life. Do you have any personal knowledge on how colorful the coral is there? It depends on where you are in French Polynesia. The Marquesas (where they originally made landfall) have murky water so they didn’t go in much. The previous video had snorkeling footage from Moorea which is one of the better snorkeling spots: https://www.gonewiththewynns.com/dead-fridge-cool-water And they’re going back to a string of uninhabited coral atolls which should have amazing coral. Stay tuned! When I use to race a smaller sailboat we called it a “Whisker Pole” that held the jib out when sailing downwind. Still an inspiration but a painful one at the moment, enjoy every moment for us too. If your decision changes to replacing your refrigerator how do you go about doing that? Where? Installation by whom? Is your current refer a common size, where you won’t have to take a saw to your beautiful galley, or if you’re going to change it out do you want to go with something different that better suits your needs? Also, I don’t know about marine fridges, but if they’re anything like residential – replace it! We replaced our decade-old one and the new one is more that twice as efficient (maybe three times). What can one possibly add? You are simply the best..and thats good enough for me! Thank you for all your effort and love you put into your magnificent shows…it is truly appreciated here in dark cold icy Norway… Take care. I’ve followed you guys from the very first video, and I enjoy every new offering. 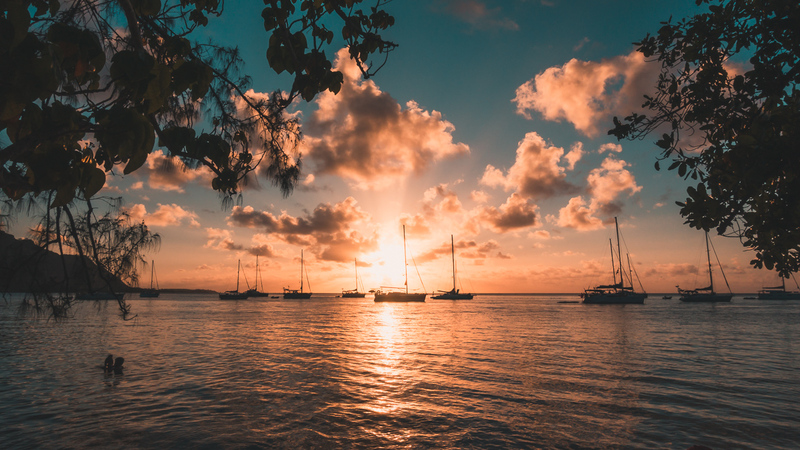 Hay you two 😎 I just wanted to tell you how much I have injoyed sailing with you and see the beauty of the ocean and the wonderful places you are blessed to see, I feel like you are family , as I watch from my couch, I ask God to protect you in your travels. Question !! At the beginning, NikKi said Jason was going to clean out the, sounded like “Knot Long” I listened several times and couldn’t quite make it out. I was just curious what that is? Another great and beautiful video. Thanks for sharing. Knot Log. Sensor for boat:s speedometer. Hope you get the fridge fixed!! LOVE the sunset time-lapse. Great work (as usual). In fact, I notice that your video work just gets better every year. Lots of fun tweaks and angles — are you increasing your skills and techniques, or taking more time to film and edit, or a combination of everything? Thx Wynns, enjoyed your beautiful video enjoy paradise but watch for stone fish if their there fwiw I came real close to stepping on one (inches) in the Micronesians. Calm seas and following winds.